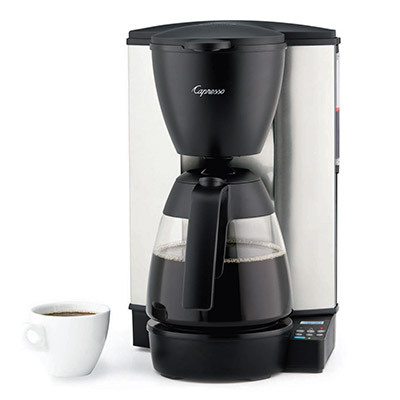 With its new glass carafe, the Capresso MG600 coffee maker is without a doubt the best coffee maker under $100. Built upon the legendary Capresso heating system, the MG600 brews 10 cups of coffee consistently at 200 degrees in under 8 minutes to extract the maximum aroma from freshly ground coffee beans. 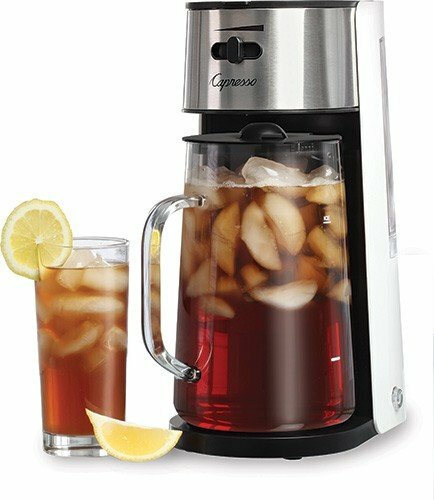 Its stainless steel body resists corrsion and fingerprints, and its new glass carafe boasts an ergonomic handle and a 2 hour auto-off warming platform. The Capresso MG600 offers additional conveniences such as programmable auto-on brewing, a pause and serve drip stopper, a special aroma function for smaller pots, and a reusable and dishwasher-safe goldtone filter. The Capresso MG600 brews 10 cups of coffee in under 8 minutes for maximum flavor and aroma with its 1000 Watt heating element. The unique stainless steel-lined heating system eliminates water contact with aluminum and reduces the need for decalcifying. Not enough time for a full pot? The MG600 has a special setting to brew 3 to 5 cups while retaining the full aroma hidden in your freshly roasted coffee beans. An AM/PM Programmable Clock/Timer lets you set the time when to brew automatically,and the “Stop-And-Serve” function allows you to enjoy a cup of coffee before brewing is completely finished. Additionally, the clock and programming will hold their settings in the event there is a short power outage or need to unplug the MG600 (for less than 10 seconds at a time). The milled stainless steel body gives the Capresso MG600 superior durability to go with its striking good looks. The easy to clean brushed metal surface naturally fights corrosion and is specially treated to maintain its luster and fight fingerprints. Chlorine makes water taste different, so it also affects the taste of coffee. The Capresso MG600 includes a replaceable charcoal water filter that removes most of the chlorine and other unwanted tastes from your tap water. The MG600 will remind you when to replace your filter. Each charcoal filter lasts 60 uses or up to 6 weeks. The Capresso MG600 offers premium coffee filtration as well with the dishwasher-safe GoldTone filter which eliminates all of those wasted paper filters. Capresso’s unparalleled customer service ensures that your days are spent as they should be…drinking consistently delicious coffee beverages! A three-tiered customer support service with evening week-day and even Saturday hours means that all of your pressing coffee questions get answered whenever you are in need. All new Capresso coffee makers come standard with an exclusive 1 Year Manufacturer’s Warranty with shipping included to and from the factory service center. No other company currently matches this level of service.